For her exceptional leadership as an Acting Director at the Government Accountability Office(GAO) in Washington DC. Ms. Clowers demonstrated innovative approaches in GAO’s work responding to the economic crisis by assembling high-functioning teams to produce real-time, high-quality, objective analyses to support congressional oversight. For example, she led GAO’s reviews of the federal government’s efforts to assist the domestic auto industry under the Troubled Asset Relief Program. Her work clarified the purpose and extent of the federal commitment and recommended changes likely to improve oversight of the government’s investments and protect the taxpayers’ interests. Ms. Clowers led GAO’s efforts to analyze transportation investments included in the American Reinvestment and Recovery Act, providing frequent progress reports and testimony to the Congress. These efforts prompted mid-course corrections by the Department of Transportation to target investments in ways most likely to stimulate the economy. Ms. Clowers outstanding work has enabled GAO to provide valuable, timely and targeted advice on the federal government’s efforts to address the economic crisis. For her sustained exceptional leadership as a supervisory physicist of a world-leading laser metrology program at the National Institute of Standards and Technology, Department of Commerce in Boulder Colorado. Dr. Dowell leads the most comprehensive program in laser metrology of any national measurement institute in the world. Her excellent people management skills and her outstanding breadth of technical expertise have transformed NIST’s national measurement program in laser metrology and standards into an extremely effective, customer focused provider of world-leading measurement services. Dr. Dowell’s team has accelerated development of a new class of test equipment, provided measurement traceability to the semiconductor manufacturing industry with best-in-the-world accuracy for ultraviolet laser instruments, and enabled highpower laser calibrations for critical US defense programs with unique detector designs and coatings, among other accomplishments. Under her leadership her team’s success has improved greatly in all areas. In addition, Dr. Dowell serves the technical and wider communities in improvement of laser safety, documentary standards, the work environment, as well as the education of a future generation of scientists and engineers. For her leadership as a principal senior adviser in the Substance Abuse and Mental Health Services Administration, Department of Health and Human Services in Rockville, Maryland. Ms. Enomoto is a versatile, innovative and thoughtful federal leader with expertise spanning policy, program and administration. During her distinguished federal career, she has served as a Managing Editor of the seminal 2001 Surgeon General’s Report on Mental Health: Culture, Race and Ethnicity and was a critical member of teams that produced White House Commission and Federal Reports on mental health. She served with distinction as a leader during the DHHS Hurricane Katrina response and recovery efforts. She was the Senior Policy Advisor to three Senate-confirmed presidential appointees and leads the agency’s portfolio on women and girls. More recently, as the Acting Deputy Administrator for the $3.4 billion DHHS public health agency, the Substance Abuse and Mental Health Services Administration, Ms. Enomoto spearheaded efforts leading to measurable improvements in agency operations, human capital management and myriad management processes. In addition to her exemplary performance at work, Ms. Enomoto has made significant contributions to her community and profession. For her distinguished service as a lead budget analyst in the US Air Force 748th, Supply Chain Management Group, 448th, Supply Chain Management Wing, Air Force Global Logistics Center at Hill AFB in Utah. During the 3 year period ending in December 2009, Ms. Harrop combined her extensive financial knowledge with her unique understanding of relational databases and web-based technologies to develop key systems which have revolutionized financial management within the Group. From the dramatic improvements in identification of available funding through systematic scrutiny of un-expensed obligations to proactive identification of payroll errors and enhanced financial reporting, Ms. Harrop has designed and executed software solutions, which have had positive impact on financial management for the organization. Specifically her efforts lead to key achievements including standardizing analytical processes across the Group and Wing, proactively preventing errors in the payroll system and creating a collaborative environment to maximize the positive impact of the logistics community. The success of Ms. Harrop’s initiatives has extended beyond the Group and is now being implemented across the Wing. The successful execution of her vision has not only saved hundreds of man-hours but has also enabled the recovery of over $5 million in available funding for reutilization in support of the warfighter. For her ground-breaking work as an electrical engineer at the Naval Undersea Warfare Center, US Navy in Newport, Rhode Island. Dr. Antonelli has performed innovative work in stand-off, laser-based sensor devices, optical systems and acousto-optic sensing. With her superior grasp of physics and engineering and advanced technical skills in optics, acoustics and signal processing, she has an impressive ability to achieve real-world solutions that expand the state-of-the-art. Dr. Antonelli has demonstrated investigative skills that make her a valuable asset to Division Newport, the US Navy and the nation. Her pioneering work in the use of laser-based, acoustooptic sonar for remote detection of sound for a variety of naval, medical and commercial applications has earned her international recognition. With her intellectual curiosity, technical expertise and generous collaborative approach, Dr. Antonelli has made great strides in the advancement of ocean optics and remote sensing research. Her efforts have enabled acoustic sensing beyond the realm of traditional acoustic transducers and will have a lasting and positive impact on US Navy warfighters. For his revolutionary work as a physicist at the National Institute of Standards and Technology, Department of Commerce in Gaithersburg, Maryland. Dr. Brown is recognized for major advances in light measurement and its applications to the environmental remote sensing of the earth. These advances include co-development of an innovative, laser-based facility for the high-accuracy calibration and characterization of optical radiation sensors. This facility is Spectral Irradiance and Radiance Calibrations using Uniform Sources—otherwise known as SIRCUS—and is revolutionizing optical radiation measurement from the infrared to the ultraviolet. Dr. Brown has also led the development of “Traveling SIRCUS”, a transportable version of the facility, to allow the calibration of sensors not easily shipped to NIST, such as ocean buoys, satellite sensors and large telescopes. These key innovations, together with other advances by Dr. Brown in light measurement, are revolutionizing the ability to detect the small decadal-scale changes in the Earth’s environment due to climate change. His discoveries are also having a broad impact on US science and technology by helping to solve key light-measurement problems in other research fields, such as optical medical imaging, solid-state lighting, non-contact thermometry, and fundamental physics. In recognition of his outstanding achievements as a supervisory physicist at the National Institute of Standards and Technology, department of Commerce in Boulder, Colorado. Dr. Kitching leads the world’s foremost research program to develop ultra-miniature devices that are bringing atomic measurement to a wide range of applications. Companies are already commercializing devices based on his pioneering work. He is the scientific leader of an interdisciplinary team with expertise in laser physics, atomic physics, and microelectronics. Dr. Kitching and his team are developing significant new technologies. Among these are: chip scale atomic clocks the size of a grain of rice that outperform other small time and frequency references by a factor of at least 1,000 and are capable of improving GPS positioning accuracy, telecommunications and other time-critical applications; chip-scale atomic magnetometers with sensitivity 10,000 greater than other portable magnetometers, which are capable of detecting concealed weapons and potentially providing new forms of medical imaging based on the magnetic fields generated by heart and brain activity; ultra-miniature gyroscopes with navigation-grade performance, capable of replacing current technologies that are 200 times as large and use 100 times the power; and a pea-sized laser spectrometer that could be used for ultra-sensitive chemical “fingerprinting” to detect and identify toxins for security and health purposes, such as monitoring pollutants and greenhouse gases. For his outstanding accomplishments as a physicist at the National Institute of Standards and Technology, Department of Commerce in Boulder, Colorado. Dr. Leibfried is one of NIST’s leading scientists engaged in the Nation’s foremost research program to develop a practical quantum computer. Quantum computers seek to exploit the strange properties of quantum mechanics to develop computers vastly more powerful than today’s best digital supercomputers for nationally important applications, such as encrypting and decrypting information, predicting the properties of new materials, drugs, and electronic devices that depend upon complex, interacting physical effects, understanding complicated nonlinear processes such as the weather and the climate, and analyzing subtle connections among vast databases of complex information. Dr. Leibfried is responsible for many research innovations in quantum computing, especially for conceiving and experimentally demonstrating the so-called “geometric phase gate”, an extremely versatile and productive way to make a quantum bit (qubit), the basic computing element of a quantum computer. He and his team have used the geometric phase gate to demonstrate a long string of world’s firsts and best—often both at the same time—in quantum computing research, culminating in the 2009 demonstration of a simple, fully programmable quantum computer incorporating all the criteria generally recognized for a scalable, practical quantum computer. Dr. Leibfried’s research ensures US leadership in the on-going quest to develop high-performance quantum computers. In recognition of his superior accomplishments as a Senior Investigator at the National Cancer Institute- Center for Cancer Research, Department of Health and Human Services in Bethesda, Maryland. Each year more than 1.3 million women worldwide are diagnosed with breast cancer and almost a third of this number die because of the disease. To date, the only well-established risk factor is inheritance of a mutant or defective copy of one of the breast cancer susceptibility genes, BRCA1 or BRCA2. To prevent cancer occurrence, sequencing-based tests can identify individuals with defects in these genes; this is an effective method but the functional significance of most changes is difficult to predict. Consequently, almost 2,000 variants of unknown clinical significance have been identified, posing a serious dilemma for physicians. Dr. Sharan has developed a simple, tractable, and reliable functional assay to understand the significance of such changes. The technology he has developed will be of global benefit to individuals having defects in these genes, as well as physicians and genetic counselors. Furthermore this approach can be used to study other genes. In the era of molecular diagnostics, Dr. Sharan’s functional assay for studying BRCA1 and BRCA2 sequence variants serves as a paradigm for elucidating variants identified in other disease genes as well. 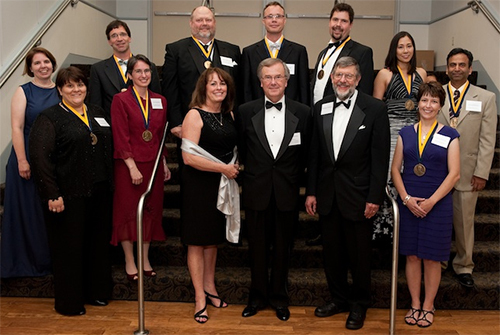 For his extraordinary achievements as a physicist at the National Institute of Standards and Technology, Department of Commerce in Gaithersburg, Maryland. Dr. Tiesinga has established one of the premier, world-class research programs on the theory of collisions of cold atoms. His prolific theoretical work is fundamental to much of the current, cutting-edge experimental work now using ultra-cold atoms to study quantum gases and establish the new field of quantum computing. Dr. Tiesinga’s work on controlling and understanding the interactions of atoms and using the so-called Feshbach resonances to tune or control those interactions has become crucial for quantum computing, for creating dipolar molecules with unusual electromagnetic quantum properties, and for understanding Bose-Einstein condensation and super-fluidity associated with neutral atoms trapped in laser-generated optical lattices. Such tunable resonances have become an indispensable tool in precise and quantitative experimental control of ultra-cold quantum gases. Dr. Tiesinga is routinely sought out by collaborators at NIST, in the USA and internationally to help analyze their measurements and discoveries. His theoretical models and analysis techniques have led to unprecedented precision in understanding and interpreting data on collisions of ultra-cold atoms and in very weakly bound molecular states. His work on modeling the behavior of ultra-cold atoms has helped extend NIST expertise in precise measurement into research areas where new quantum properties are most likely to be discovered.